Ok, so GET THIS! Mark was reading Reader’s Digest (he’s the reader in the family, i’m definitely the one that goes for the pictures! ha!) and he says, Wow…listen to this. Now, he knows I love candy corn and I wait for halloween for it to come out! Come to think of it, I kind of have a favorite candy with each holiday, that I wait for….it’s speckled jelly bean eggs for easter, conversation hearts for valentines day, etc! I never realized that until now! Ok, anyway…I digress, as usual! SO, the CANDY CORN story!! He says, “do you know why you have never seen an advertisment or promo ad for CANDY CORN!?! I say, “NO”, simultaneously racking my minds library of ads I’ve seen in my life to realize, he’s RIGHT, I’ve never seen a CANDY CORN advertisement. He says, “that is because ALL the candy corn that was EVER made was made in 1911 and they have NEVER made any more since! So, they only have soo much and have to distribute it evenly and slowly…..so they can’t advertise it or they would RUN OUT”. Of course, my immediate reaction is, THAT IS SUCH A LIE!!! Although, I hadn’t really ever thought reader’s digest was known to LIE!! So, then I can’t help but say, “so what you are saying is that those HUGE metal cylinders that you see in the middle of fields as you are driving on the highway or a country road are full of the CANDY CORN SUPPLY FOR THE WORLD!? !” I mean…get SERIOUS!!! Although, if that is true….watch out because I’m going to go raid one of those metal things!! Isn’t that CRAZY??? Honestly, I don’t totally believe it…but I did read it with my own two eyes!! So, there is your shocking fact of the day, if, in fact, you consider that shocking OR you consider that to be a fact! uh… hm.. I think you’re being played with…! ;o) They still make candy-corn. They do it all by machine now. In the 1800’s they did it by hand, but now it’s machine made. Well, thank you for making me feel better, Julie!! I was definitely skeptical! Here’s the question….WHY on earth would Reader’s Digest publish that?? I read it with my own eyes!! That is hilarious! Maybe it’s Reader’s Digest version of a “trick” or treat… pretty funny, either way. It’s a quote from a Lewis Black bit. I don’t know if it was on his comedy special or on the Daily Show. Was Mark showing you the joke section? WAIT….shut up…that was the JOKE section??? Of course, I didn’t see that part! MAN…..I’m really feeling like a blonde now!!! Patricia….he didn’t mean like a picture of it on the manufacturers website….like an actual promo…. magazine or tv ad promo! Owell….doesn’t matter now because it was a JOKE!!!! Don’t feel bad, Jess – we all have our blonde moments, even us non-blondes. Here’s another interesting factoid, though… Did you know that the word “gullible” isn’t even in the dictionary? Any candy corn lovers out there should try the new hershey kiss candy corn flavor. It is delicious!!! Might sound strange, but trust me you need to try it!! Kim – who is thankful she read all the posts before sending her email. Well, I was going to send you a link also, but I see you’ve been taken care of. I would have to wonder about eating 100 yr. old candy, too. I’m so glad this turned out to be untrue because I love those little pun’kins too much. I do the same thing, I have a candy for each season that I really look forward to: Gobstopper hearts, Reese’s eggs and marshmallow eggs and Starburst jelly beans, candy corn pumpkins and palmers chocolate, and then fudge. I know I’m forgetting some somewhere. Hilarious! Good to know they are still making it and we aren’t eating 96 year old Candy Corn! Hahaha! I’m so happy that fall is finally here, now its sweatshirts and jeans, sitting in Starbucks drinking my Vanilla Chai topped with delicious whipped cream. The pumpkin patches, all the cute little trick-or-treaters walking around town. I’m so happy for this time of year…..
that is the biggest load of crap i’ve ever heard. brach’s candy corn, accept no substitute! I love that you thought it was true, because I totally would have believed it too! Hmmm. I always thought Peeps were your favorite Easter candy! so i was shocked as well hearing this… so i googled candy corn, 1911. this is what i found. 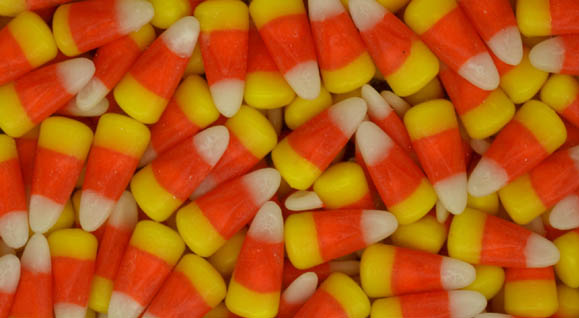 “All of the candy corn that was ever made was made in 1911,” Lewis Black once joked. “Since nobody eats that stuff, every year there’s a ton of it left over.” hhmm… i don’t know what to believe! haha. Brenda….I forgot to mention PEEPS!! BUT…ONLY STALE and kinda crunchy OR frozen!! 🙂 haaa!! Ok….so I pulled back out the readers digest to discover that this comment was NOT part of a comedy section or joke section…or whatever. It was the little one liner at the end of a story!! Soo, I have since discovered that this Lewis Black dude is a COMEDIAN and reader’s digest is known to put these comic bits at the end of their stories…every now and then! Soo….THAT explains it. THANKS FOR MAKING ME FEEL DUMB, reader’s digest!!!! SOOO…there you have it, folks! YET AGAIN, the BLONDE has gotten the best of me!! 😉 hehe!!!! I just bought Hershey’s Kisses Candy Corn flavor last weekend at a Louisville Target: Heaven!